Hello again! For this week’s post, we will celebrate powerful charts in classrooms from the exotic locale of Taipei American School, located in Taipei, Taiwan. Before we start looking at charts, a word or two about the school. Taipei American School (TAS) is a pre-K to twelve school located in the Tien-Mu area of Taipei. The bulk of their students are Americans of Asian Heritage with a smaller percentage from around the world. The teachers have been using readers and writers workshop for the past four years, led by a fearless and brilliant coach: Carrie Tenebrini. All the teachers at the school are warm, lovely, passionate educators and their quest for student independence and clear explicit teaching is evident in the charts they make. As a visitor in Taipei, the teachers made sure I was well fed and cared for, but there were times when I found myself alone with another colleague. Rather than give in to panic surrounded by a language we did not know, nor could we read, we used the one thing readily available to us: symbols and visuals! 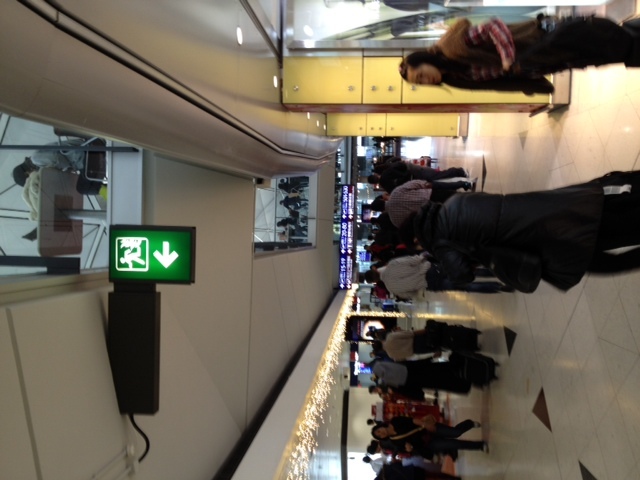 It was striking again and again, how critical visuals are in helping one function in the world. 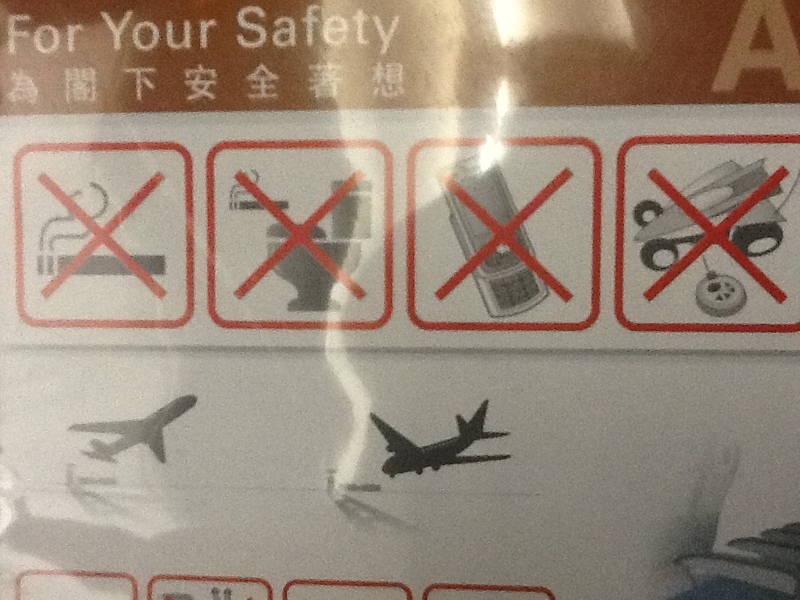 From the above example of “do nots” when flying (Although, who exactly, is operating remote control cars is not clear to me) to the below icons for exit and slippery, we were able to maneuver our way through the country. The same is true for the charts in our classrooms. Especially in a school with a large percentage of English Language Learners, like TAS, visuals and icons are the linking language for students. They may not know the word in English, but they know the concept and a visual or an icon helps them interpret the charts in your room. The first grade team at TAS has long been talking about getting more student images on their charts. 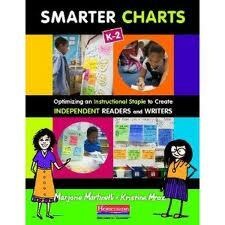 From sample post-its to photographs, using student work and pictures makes the chart instantly more accessible. 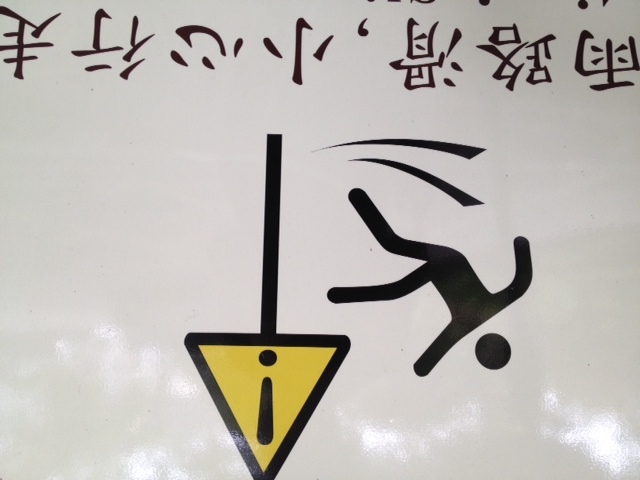 Even if I am not sure of the language, the pictures show me the behavior that I can replicate on my own. As an aside, this team also color codes their charts- anything green is reading, anything blue is writing… so smart! 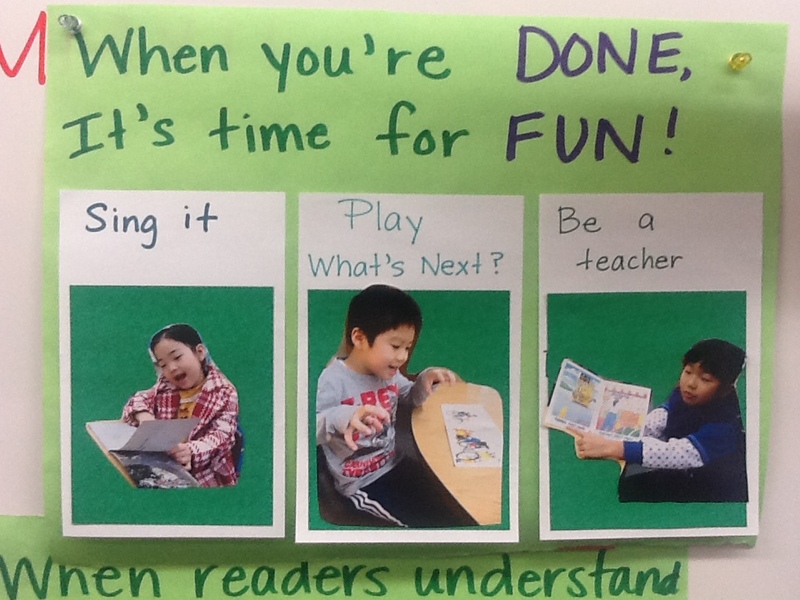 Amanda, a wise second grade teacher at TAS, used a photograph in this chart to help her readers get and stay organized with their materials. The photograph allows a touchstone for children to refer back to, as well as a prompt for what to do every day. 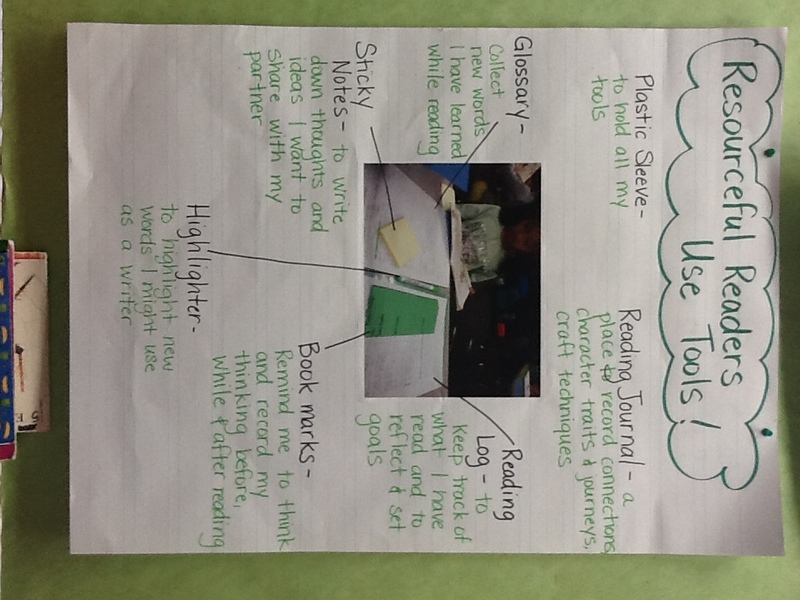 The annotations around the side support the work that readers should be doing with these tools! Jennifer, another thoughtful second grade teacher at TAS, has been working with her students around fluency. 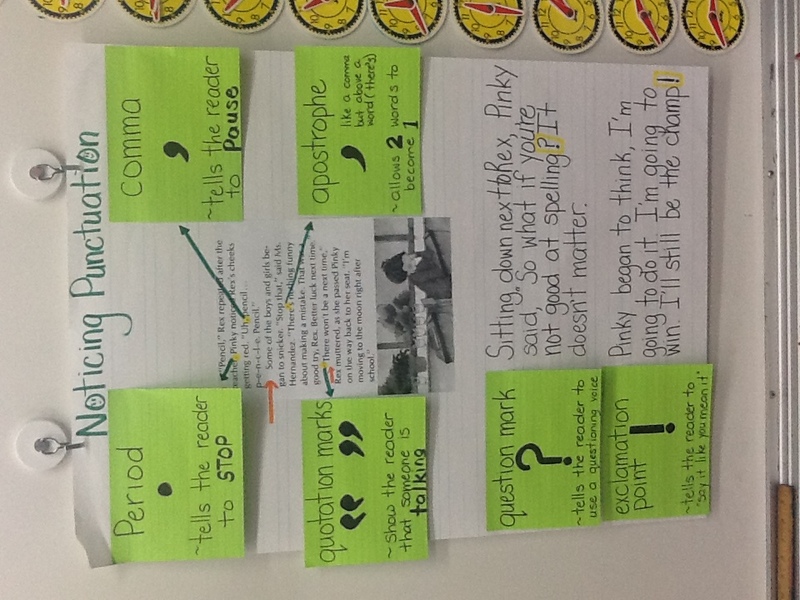 This chart takes a text that the students know well through shared reading experiences and annotates it with post-its. On each big sticky note there is an icon to show what to look for and an explanation on how that will change your reading. Since children spent a long time working on this text, there is no new instruction happening on this chart, rather a powerful reminder of all they know, so they can use it again and again. Carlee, an amazing kindergarten teacher, is the source of this chart. Before we look at how she is holding five year olds accountable, a quick word about the symbols. The book lets the children know this is a reading chart. 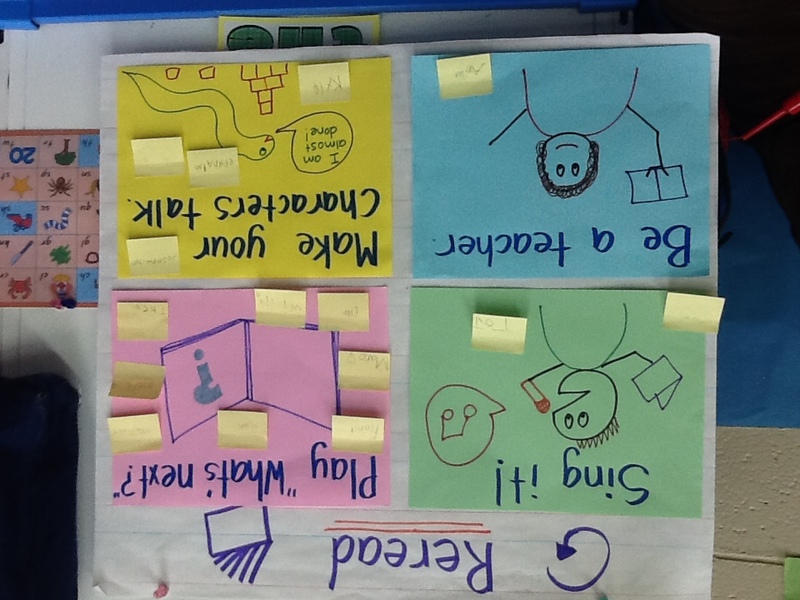 The symbol for rereading was spoken about and made with our fingers before it was put on the chart, and each section of the chart has a clear picture to remind students of the strategy. This chart was built over several days, but Carlee took this chart one step further when she had her five year olds put their name on the strategy they were going to try this day. This small act of goal setting holds children accountable for the teaching you have done and creates a purpose to the work they are tackling back at their own seat. Thanks again to the incredible teachers at TAS for a week of hard work, smart thinking, and powerful practice! Until next time, Happy Charting!